Chennai Super Kings 4-202 (Suresh Raina 84, MS Dhoni 63*, Dale Steyn 2-23) beat Sunrisers Hyderabad 7-190 (Darren Sammy 50, Shikhar Dhawan 48, Dwayne Bravo 2-34, Jason Holder 2-39) by 12 runs. CSK hammered 202 runs after losing four wickets in the allocated 20 overs and Sunrisers Hyderabad scored 190 with three wickets left in the required overs. Suresh Raina (Chennai Super Kings) was declared ‘Player of the match’ for his polished knock of 84 off just 57 balls. The 10th match of the Champions League Twenty20, in Group B was played on Thursday, September 26, 2013, at JSCA International Stadium Complex, Ranchi. Earlier, Shikhar Dhawan, the skipper of Sunrisers Hyderabad, won the toss and opted to field first. CSK lost their first wicket without any run on board as Suresh Raina got together with Michael Hussey. They scored 14 runs in three overs while the latter was dropped at 8 and he hit the first six of the innings in the sixth over. Hussey was caught behind by Parthiv Patel off Jean-Paul Duminy for 23 as the total touched 45. Subramaniam Badrinath came in next as Raina hit his 4th four in the ninth one and completed his 25th Twenty20 fifty with another boundary in the 13th over. Suresh Raina added 1 six and 2 fours and the score was enhanced to 115 in 14.1 overs when Badrinath was gone for 13 and was replaced by Dhoni. The first kept on consolidating whereas Dhoni punished Thisara Perera for 32 runs with 5 sizzling sixes in the 18th over. Suresh Raina was caught by Perera off Dale Steyn for 84 from 57 deliveries with 1 six and 9 fours. MS Dhoni hit two back to back sixes in the final over, powered his 15th Twenty20 half century. He remained unbeaten 63 off 19 mere balls with 8 towering sixes and 1 four and guided his team to 202 in 20 overs. 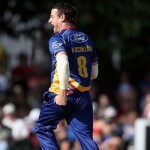 Dale Steyn and Jean-Paul Duminy were the only successful bowlers with two wickets each. Parthiv Patel along with Shikhar Dhawan opened the innings for Sunrisers Hyderabad in a brilliant manner by scoring 49 runs in the first five overs with four boundaries each. Dhawan hit the first six of their innings in the next one and the boundaries were flowing regularly from their willows. They rushed to 87 in 9.2 overs when Patel was unluckily run out for 37 off 28 with 6 fours. Jean-Paul Duminy was clean bowled by Raina for a duck and Dhawan became the third victim at 91 at his personal score of 48 off 34 balls with 1 six and 7 fours. The fourth wicket went down at 106 after 13.1 overs as Darren Sammy took over with a little assistance at the other end. He dispatched 3 sixes in the 15th over off Ravindra Jadeja followed by a couple of fours in the 17th one. 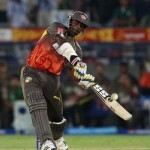 Sammy was dropped twice during his innings but he smashed his second Twenty20 fifty in the 19th over with another six. His stumps were destroyed by Jason Holder for 50 off just 25 deliveries with 5 lofty sixes and 2 fours. Sunrisers Hyderabad managed 190 for the loss of seven wickets after the last ball of the 20th over was bowled. Jason Holder and Dwayne Bravo were the top wicket takers with two each whereas Ravichandran Ashwin and Suresh Raina got one wicket each. Chennai Super Kings triumphed in the game with a close margin of 12 runs and earned four points.